Until yesterday, I always thought that a quintet was either a group of five musicians, or a piece of music written for them. It seems that Quintet was also the name of a science fiction film made in 1979 and set during some future ice age. But by all accounts, the movie was rather heavy going. Confusingly, there’s also a movie called Quartet made in 2012, directed by Dustin Hoffman and set in a retirement home for former professional musicians. In classical music, a quintet can be made up of any instruments you care to name, but in practice it comes down to a handful of tried-and-trusted combinations. During the last few decades there’s been a dramatic increase in the number of brass quintets and woodwind quintets but in contrast, the string quintet can be traced back to early years of the seventeenth century. A string quintet is usually a standard quartet (two violins, a viola, and a cello) supplemented by a fifth instrument, which is nearly always an additional viola, cello or double bass. Despite the fact that Luigi Boccherini managed to write over a hundred quintets, the form has always been less popular among composers. Mozart for example, wrote a couple of dozen string quartets but only six string quintets. 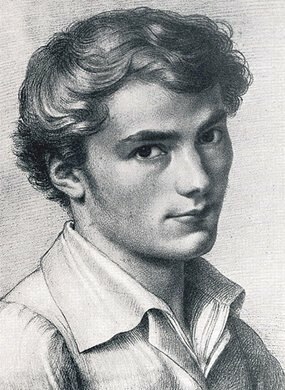 Franz Schubert as a young man. While the piano trio and piano quartet were well-established in the eighteenth century, the piano quintet didn’t come into its own until the middle of the nineteenth. It can be traced back to the late classical period, when piano concertos were sometimes transcribed for piano with string quartet accompaniment. During the mid-nineteenth century, the instrumentation of the piano quintet settled down to piano and string quartet and has remained the same ever since. Many earlier piano quintets, especially those before the 1820s were scored for piano, violin, viola, cello, and double bass. One of the best-loved works of this type owes its fame to a song about a fish. It seems odd to name a quintet after a fish, but as with most things, there’s an explanation. Schubert wrote this work in 1819 when he was twenty-two years old and the fourth movement is a set of variations on his song Die Forelle (“The Trout”) which he wrote a couple of years earlier. Schubert was perhaps best-known in Vienna as a song-writer and the song Die Forelle was something of a hit there. The quintet wasn’t published until a year after his death at the age of thirty-one. Schubert the song-writer is very much in evidence in this thoroughly joyful work. The video is about as visually unexciting as they come. One camera, same shot. But the playing is so good that I hardly noticed because it’s not much different to the view you get sitting in a concert hall. Incidentally, you might be interested to seek out Schubert’s last chamber work, his String Quintet in C major which was completed two months before his death. It’s his only string quintet, and perhaps one of the greatest pieces of chamber music of all time. Mozart wrote two major works for clarinet which are still in the repertoire today, the concerto and the quintet. They were both written for Anton Stadler, one of the leading Viennese woodwind players of the day. Mozart completed the quintet in September 1789 and it was first performed the following December. Incidentally, both works were written for the basset-clarinet which has an extended lower range. In many ways, this is a brilliant work which draws on Mozart’s enormous skills in song-writing, drama and harmony. The Larghetto which forms the slow second movement is stunningly beautiful. But even so, the last movement has always struck me as a repetitive series of variations on a singularly banal tune. The lugubrious third variation with its tiresome viola solo sounds like a lapse of taste on Mozart’s part. I have the score in front of me and can’t help wondering whatever he was up to. But perhaps poor old Wolfgang had been on the bottle that day and was just a bit zonked. The Old City String Quartet (now the Dover Quartet) is made up of young musicians from The Curtis Institute of Music in Philadelphia. Clarinetist Ruokai Chen gives a lovely performance. He’s not yet in the class of clarinetists like Martin Fröst or the late Reginald Kell and Jack Brymer, but he’s exceptionally good. Oh yes, I’ve just discovered that there’s yet another movie called Quartet made in 1981 and set in Paris. It’s all becoming too confusing.